People often complaint of toothache during eating or chewing and some have toothache, swelling, and sometimes bleeding. If you are also facing these problems in tooth then you must be familiar with the severe pain that makes you crazy. If you don’t treat the pain right away, it may take a giant form leading to a tooth loss. However, there are some quick home remedies that can work like a saviour at the nick of time and give you relief from the threatening pain before you get an appointment with your dentist. Clove Oil : From the past centuries, clove oil has been used as a dental pain remedy as the key component of clove oil is eugenol which acts as a pain reliever for your tooth. All you have to do is to apply two to three drops of clove oil directly on your tooth and let it stay there without licking it. Be prepared for a bit of pungency as it is a pungent spice. Vanilla Extract : As vanilla extract has antiseptic and analgesic properties, it helps get instant relief and you can apply this extract many times a day. Just take two or three drops in cotton swab and apply it to the tooth. You will feel the reduction in pain within two hours. Tea Bag : If you are suffering from swelling along with drastic pain in tooth, then you must try this home remedy. All you have to do is put a tea bag in water for some time and then gently press it to the swelled area of your gums and the specific tooth. You will immediately feel the difference. It’s tannins of the tea bag that helps in reducing the swelling and pain. If your tooth is not sensitive to cold water, then you can put the tea bag into cold water and then use it as it may help you better to get the pain off. Baking Soda: Take a small amount of baking soda with some water and apply it to the tooth with a cotton ball. You can also dissolve the baking soda to water and use it as a mouth rinse twice or thrice a day. As the baking soda has anti inflammatory and antibacterial properties, it helps in curing the infection and swelling. Hydrogen Peroxide: Take 3% of Hydrogen Peroxide and rinse your mouth with it. After that, rinse your mouth with water for two three times. You will eventually feel better. You can repeat the process when required. This eases the infected tooth and foul taste that we have due to infected tooth. Oregano Oil : You can directly apply the oregano oil with Q-tip on the tooth in which you are having pain and repeat the process in some hours. As oregano oil has carvacrol element and hence analgesic and anti inflammatory properties, it kills the bacteria causing infection and reduce pain in the tooth and gum line area. Oil Pulling : Take 1-2 tablespoon of coconut oil, warm water, a toothbrush and toothpaste. First, swish the coconut oil in your mouth for approx. 20 minutes but don’t ingest that. After 20 minutes, spit the oil. Rinse your mouth with warm water and finally have a fine brushing. The process is also called the swishing therapy and has been used to treat mouth swelling, pain, gingivitis and bleeding. As coconut has sufficient amount of lauric acid that has antimicrobial as well as anti inflammatory properties, it proved effective in healing tooth pain and other problems. Whiskey : Take a cotton ball and soak it by whiskey and apply it to the tooth. This will provide temporary relief to your pain. So repeat the process until you visit the dentist. Ginger: Having the ability to reduce swelling and pain; ginger works best in toothache and swelling along with cayenne pepper. Just powder the ginger root and prepare a paste by adding it to 1 teaspoon cayenne pepper and water. Now apply this paste on your tooth and leave it for some time. You can repeat the process when required. Just be sure not to apply this on gums as it may cause irritation. Olive Oil : Dip a cotton ball in the virgin olive oil and apply it on the tooth with pain. As this oil contains the phenolic compounds, it has anti inflammatory properties that help reducing the pain and swelling. You can apply this oil twice or thrice a day. Onion:Take a raw onion, chop it and place it to the affected tooth for 2-3 minutes. Repeat the process twice a day and you will eventually see the results as it is the most quickest and effective home remedy you can instantly do. Onion not only reduces your pain but also kills the bacteria or germs that cause the pain and infection to the tooth. Warm Salt Water : Dissolve 1 tablespoon of salt into a cup of warm water and rinse your mouth with it. Do this process thrice a day and the swelling will surely reduce. Garlic Clove : Crush the clove of garlic, mix it with some rock salt and apply this paste to your affected tooth. Garlic clove contains allicin, a strong antimicrobial agent that helps in killing the germs and reducing the swelling and pain in tooth. You can apply this paste twice a day. Cinnamon: Prepare a paste with 1 teaspoon of Cinnamon powder and 5 teaspoons of honey and gently apply this on the affected tooth area. Repeat this twice or thrice a day until the tooth pain diminishes completely. Besides being used as a major spice ingredient, cinnamon is used to cure numerous problems and toothache is amongst them as it has antimicrobial and anti inflammatory properties. Honey provides smoothness to the gums and works as an antiseptic. Thus this home remedy is vastly used to cure toothache. Peppermint Tea : In a cup of boiling water, steep 1 teaspoon dried peppermint leaves for about 20 minutes. Strain the liquid and let it cool for some time. Your natural mouth wash is prepared. Rinse your mouth with it till you get some relief. As peppermint tea can numb the affected part of your mouth to cure it off with its menthol content, it plays a big role in relieving the irritation and inflammation. Black seed Oil : Take a Q-tip and dip it into the black seed oil. Apply this oil to the affected tooth area and give it a gentle massage for some seconds. You can prepare a mouth wash by adding a teaspoon of black seed oil to warm water and rinse your mouth with it. Being antimicrobial, black seed oil helps a lot in healing the infection and damage caused by bacteria to the tooth and reduces pain. Asafetida : Take a pinch of asafetida powder to add it in 1-2 teaspoons of fresh lemon juice. Make the paste and apply it on the tooth with a cotton ball. Repeat the application in few hours if required. This home remedy works best if the pain is caused by cavity as it has antiviral and anti fungal properties that helps reducing germs and bacteria in the tooth and gum. Guava Leaves : Guava leaves are very effective in reducing the pain and infection in tooth. What you have to do is to boil some water and put 2-3 guava leaves in it along with some salt. Strain the leaves and get it cooled for some time. Now use this liquid to rinse your mouth two to three times. You will feel the reduction of pain instantly. 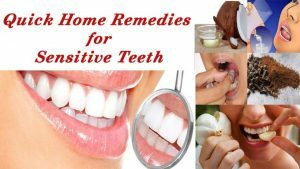 These are the home remedies that can effectively work for you if you ever have a sudden pain or soreness in you tooth or gum line area. So don’t wait and suffer with the pain until you can get it treated by the dentist. Practice these home remedies and get your pain and swelling relieved in the nick of time.